When you are considered to be an experienced Puppet user or you just started using Puppet, this book will help you with all requirements on getting a good Puppet implementation. The book is not only about Puppet… To get an enterprise ready Puppet environment, you will be guided through the configuration of all needed linux components which results in a scalable and high available Puppet installation. Some other good topics are GIT version control, Private and Public modules, GitHub, reporting and troubleshooting. The book is based on a RedHat/CentOS environment, so when you use an other Linux distribution, you have to change some of the commands but that shouldn’t be a problem for any experienced Linux engineer. 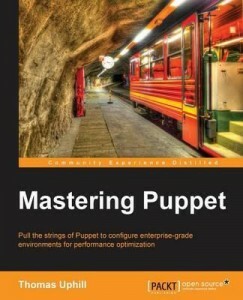 This book is a must read for those who will implement puppet on 20+ nodes.